It’s a word you are bound to hear quite often in Indonesia, probably every day if you are in a more remote place. In Malang, I would usually have black outs two or three times every week. In Gorontalo, even though I live within the city limits, I am lucky if I get two days a week without one. Some ETAs in more remote areas have never experienced a full day of electricity. No two mati lampu are created equal. 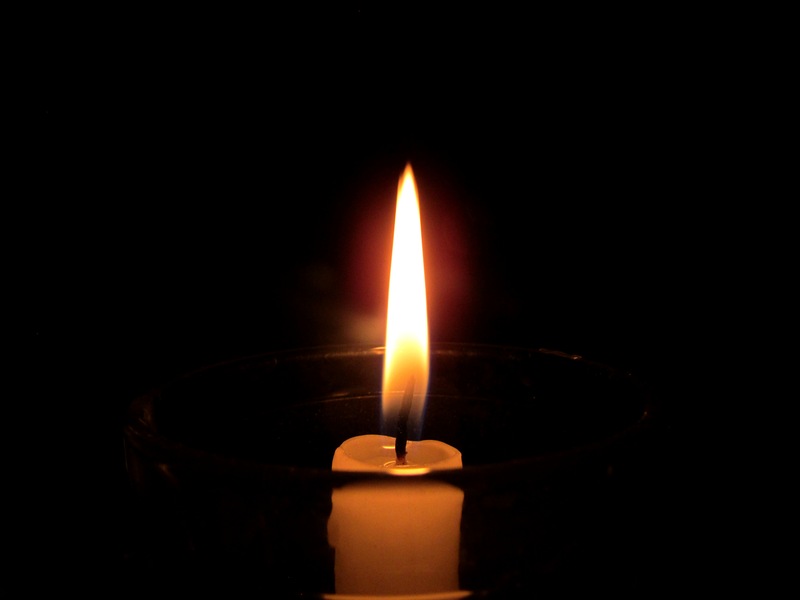 There are the little blips in your day, the mati lampu that last only an hour or two. There are the more annoying mati lampu, which last up to four or five hours, and send you seeking the cafes with generators so that you can finish your lesson for the next day. And then there are the mati lampu that last eight, nine, ten, eleven hours… and those are the ones that make you begin to wonder if the electricity will ever turn back on. After well over a year in Indonesia, I have learned how to deal with mati lampu, at least to some extent. I try to keep all of my electronics—laptop, kindle, iPod, mobile phones—charged at all times, and my power bank was probably one of the best purchases I made prior to moving to Gorontalo. I have a small lantern bright enough to journal by. Candles are placed strategically about my house that I can quickly light when mati lampu arrives after nightfall, so that I can still cook and work out and potentially even do laundry (and also so that I don’t injure myself stumbling around in the dark). There are old tin cans full of ice in my freezer, for those mati lampu that go on for so long that I start to worry about my food spoiling. And, perhaps most importantly, I always keep the plastic trash can that acts as my bak mandi (i) full of water. 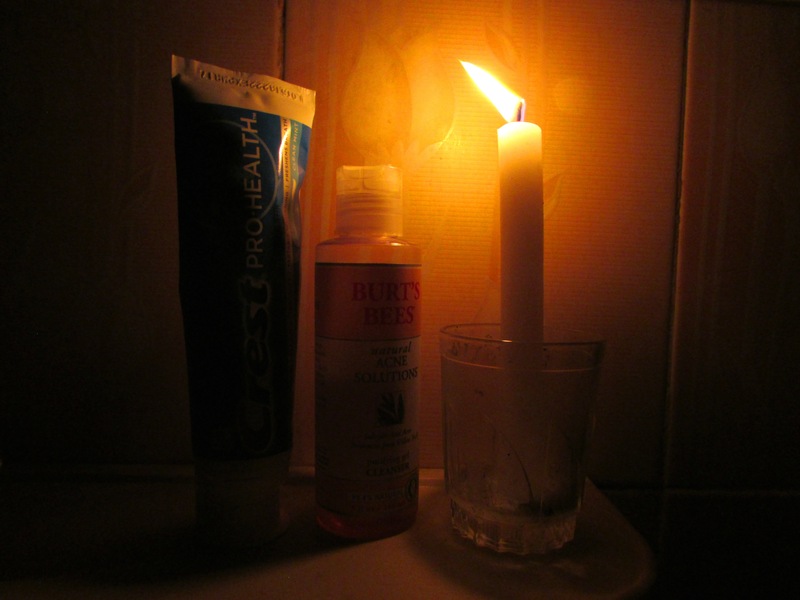 No electricity means no water in the pipes, and at the end of a long day sweating in crowded classrooms want to know that I can shower, even if it is by candlelight. But even with all the preparation I try to have, there are still times when the electricity goes out and I am left with a dead phone and laptop, e-mails I was supposed to send, and a blog I wanted to write. It is then I have to utilize what is probably my greatest tool for dealing with mati lampu: acceptance. 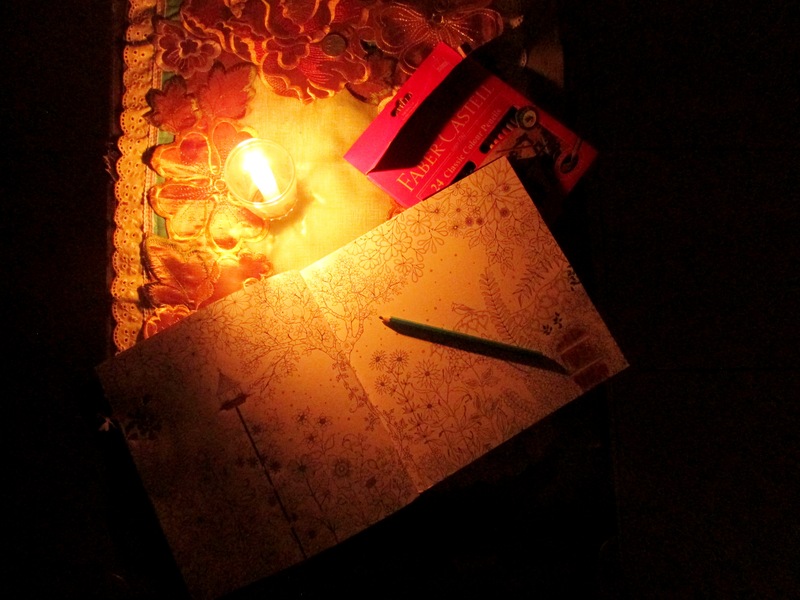 I set a candle on the table and try to do as much as I can with good old pen and paper. I go to bed early, my thin sheet tossed aside as I try to stay as cool as possible. There is nothing I can do, so I keep on doing what I can. If it is still daylight, mati lampu can sometimes result in an enjoyable few hours. Step outside during mati lampu and you are bound to find everyone else in the neighborhood doing the same. Some of my longest chats with my neighbors have happened because mati lampu took away our ability to be productive, and so we were forced to spend time with one another. I recently talked to a friend who was an ETA last year, and she mentioned that she found herself strangely missing mati lampu some days, mostly because of that very reason. Mati lampu forces you unplug, to slow down, to step outside. It is endearing in that way. This is not to say that I necessarily enjoy mati lampu, and don’t regularly wish I was in a place with more consistent electricity. But I have come to accept mati lampu for what it is, the good and the bad, the frustrating and the endearing. Grace Wivell is a 2014 graduate of Ithaca College, where she studied English Education. She is a second year ETA. Her first placement was in Malang, East Java, and she now lives, learns, and counts cows in Gorontalo, Sulawesi. You can follow her blog at https://allfortheloveofwandering.wordpress.com/. (i) Shower heads are not all that common in Indonesia. Much more popular is the bak mandi, a large basin, often tiled, that is kept full of water, which you then scoop on to your body in order to bathe, and into the toilet to flush. My bathroom does not have a proper bak mandi, because there is a showerhead which I’m supposed to be able to use, and because I have a western toilet. But because the water pressure is not strong enough to reach the shower head most days, and the toilet does not flush, I use a bright pink plastic bin that was in my bathroom when I arrived as a make-shift bak mandi. It does the trick.